There’s no jazz pioneer like the incredible William James “Count” Basie who graced the jazz scene in the 1930’s with his memorable and exhilarating performances and compositions. 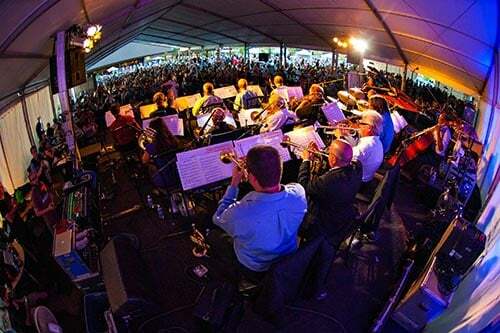 This summer the H2 Big Band will pay tribute to the monumental music of this jazz big band leader in an uplifting, and inspirational performance. Back for a second year in a row, the H2 big band will perform with an outstanding 17 piece band led by trumpeter Al Hood and pianist Dave Hanson. They will tackle the greatest hits of Count Basie that the whole family can hum and dance along to! After all, there’s no big band sound like Count Basie’s arrangements. With Count Basie’s distinctive sounds and melodies, it’s hard not to fall in love with this sophisticated yet playful music. Count Basie was indeed a founding father of the big band musical era, thriving through the decades of vaudeville, the swing era, the bebop era and the Soul/Blues era. 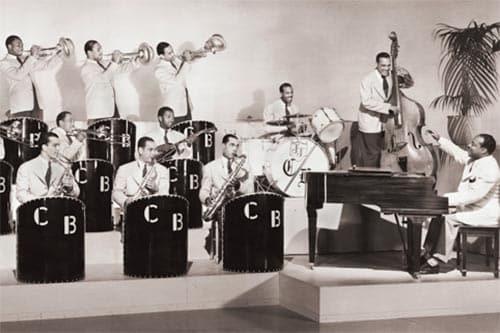 In an era when African-Americans did not lead bands, Count Basie took the initiative to start his own orchestra, including the hottest jazz musicians of the day. With his remarkable leadership and jazz composition skills, it was no surprise his songs would instantly become household hits. Over the span of his career, earning nine Grammy awards and a spot in the Grammy Hall of Fame, some of Basie’s most loved songs would include “One O’clock Jump”, “April in Paris”, “Alright, Okay You Win”, and “Everyday I Have the Blues”. Collaborating with different instrumentalists and notable jazz singers including Tony Bennett, Ella Fitzgerald, and Frank Sinatra, Count Basie performed for fans all over the world, and recorded over 480 albums. Count Basie not only made an impact in jazz music, but also served as a humanitarian and philanthropist and received a Kennedy Center Honor. 2015 marked over 80 years of Count Basie’s music, and thanks to tribute bands such as the H2 Big Band, Basie’s music is still swinging today! While it is truly hard to replicate the exact sound of Basie’s music, the H2 Big Band creates an engaging and authentic representation that makes you feel like Basie is musically present. Check out this video of Count Basie’s “One O’clock Jump ” to get you in the mood, and we’ll see you at the show! 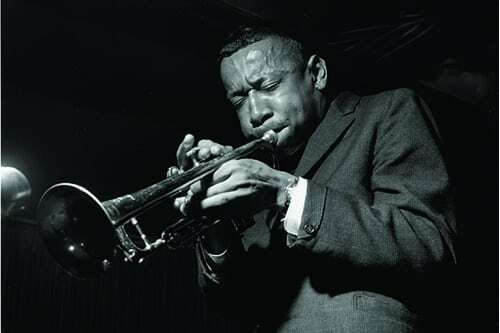 Edward Lee Morgan was born in Philadelphia, PA on July 10, 1938. Lee as he was known, received a trumpet on his 13th birthday and for the rest of his life his identity would be bound up in the three valves and 4 feet 10 inches of tubing comprising his horn. Lee would become one of the greatest players in the history of jazz, combining a technical virtuosity that allowed him to play scorching and powerful passages, with each note precisely articulated, even in the highest register of his horn, with a sensibility that allowed him to play some of the most tender ballad solos in jazz. He would also go on to compose may great tunes and would transition from hard bop (bebop with influences from r&b, gospel and blues) to an avant-garde/modal style. Lee began playing professionally at 15 and by 18 he was playing with the jazz giant Dizzy Gillespie and his big band and was signed to Blue Note Records, one of the top jazz labels of the day. Over the next 15 years he would record 25 albums as a leader for the label, many becoming jazz treasures that amply demonstrate his musical genius. 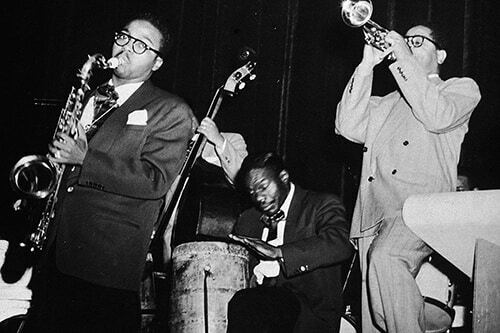 In 1958 Dizzy’s band broke-up and Lee made a faithful decision to join Art Blakey’s Jazz Messengers. Musically the decision was brilliant as the band was led by the legendary drummer Art Blakey who had an extraordinary track record of choosing raising stars as his sidemen and Lee was no exception. Being one of the most popular bands in all of jazz, Lee was able to play often as the Messengers toured the US and Europe, playing all of the great festivals and club dates everywhere. Lee rapidly developed into one of the most talented trumpet soloists in jazz and recorded numerous albums with the Messengers, several of which, “Moanin’” and “The Freedom Rider,” are in the jazz pantheon of greatest recordings. However, the decision was to change the course of Lee’s life as Blakely was a heroin addict and he introduced many of his sidemen to heroin. Whether you call it horse, smack, dope, junk or the myriad other names it has been called, the opioid drug is highly addictive and Lee became an addict before he was 21. 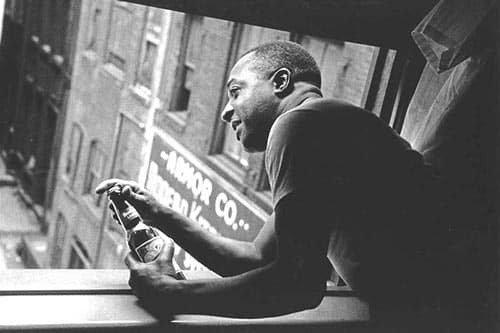 His addiction became so severe that in 1961 he had to leave the Messengers and return to his parents’ home in Philadelphia to try to kick the habit. He spent the next two years removed from the jazz scene in NY and in late 1963 he “took the cure” and was back in NY before yearend. For the remainder of the decade he would perform and record, both as a leader and as a sideman, including with the Messengers. Many of the recordings were extremely well received and his biggest hit was his “comeback” album released in 1964. “The Sidewinder” crossed over into great commercial success and things were looking up for Lee, but the very sad reality was Lee wasn’t cured of anything, he just learned to manage his addiction and began substituting methadone and ultimately cocaine for the dope he had been addicted to. By 1967 Lee was a junkie who had fallen so low that he was seen sleeping on the street outside Birdland without shoes and committing petty crimes so he could buy drugs. On one particularly wintery night that year Lee had sunk so low that he had pawned his horn and top coat for some drugs that he desperately craved and once again he came to a crossroads in his life. This time it was “Helen’s Place,” the apartment of Helen More, whose abode was a haven for strung out jazz musicians. Helen was a jazz fan who had a checkered past and had moved about the fringes of the jazz-drug culture for a number of years, working in Harlem for drug dealers, but a non-user. She was 22 years Lee’s senior and on that faithful evening she took Lee in, got his top coat and trumpet out of hock and for the better part of the next 5 years managed him professionally and personally. Eventually she would take the name Morgan and they were seen as husband and wife, although they never married. Part mother, part wife, part manager, Helen was the ever present force in his life, and although he continued to be an addict, she made sure that he showed up to his gigs and performed. Lee’s niece would later say: “It was like Helen was addicted to him.” Whatever the reasons the relationship became extremely toxic and Lee began to pull away from her and by 1971 he began to see another woman, staying away from Helen for prolonged periods of time and she stopped coming to his performances. Helen unsuccessfully attempted suicide and the relationship was clearly over. In the early hours of February 19, 1972 Lee was performing at the NY club Slug’s, his new lady friend was seated at the table Helen previously had held court at. Helen entered the club and after an altercation with Lee she shot him once in the chest. He was 33 and in a fit of jealousy Helen had done what 15 years of drug addiction didn’t do, killed him, one of the greatest trumpet players in the history of jazz. It might be surprising that a flute player stirs up the kind of energy that causes audiences to leap on stage and start dancing. Or to make a blind man claim that he can see. But such is the miracle of Orlando “Maraca” Valle’s music. Hailing from a family of musicians in Havana, Cuba, Valle took up the flute at the age of 10 on the suggestion of one of his talented brothers. In his 20s, Valle joined the band Irakere as arranger, flute and keyboard player. Founded by Chucho Valdés and Paquito D’Rivera, the ensemble was famous throughout Cuba and Latin America. Soon Valle was rubbing shoulders and performing with the likes of Dizzy Gillespie and Chick Corea. It was in 1994 that Valle launched his solo career and has made remarkable traction ever since as a widely respected writer and arranger, collaborating with some of the hottest jazz artists across the globe. Spontaneity is the cornerstone of Valle’s style and live performance energy. It’s also what brings him his greatest joy on stage. Then again, Valle can name many sources of musical passion. When it comes to playing with musicians he does know, for instance, his own Latin Jazz All-Stars, the “musical conversation” reaches sonic proportions. So exceptional is Maraca’s music that it has literally delivered vision and an uncanny urge to dance, even to the most unassuming of audiences. This is the story of how sugar, drums and clave shaped the development of Afro-Cuban jazz … but a little history first. Columbus’ discovery of Cuba in 1492 led to Spain’s colonization of the island. Over the next 150 years, Havana became the way-station for ships carrying the wealth of Mexico back to Spain, while receiving the rich music and dance traditions of Spain. Becoming the first great music capital of the Western Hemisphere, Havana, along with New Orleans and New York City, were the only cities in the Western Hemisphere with opera companies in the 19th century. By 1900, it was the third largest city in the Western Hemisphere. During the 19th and early 20th century people moved freely between Havana and New Orleans via daily ferryboat service. It was a time of musical cross-pollination as musicians soaked up the rich musical traditions of each culture. Not to be forgotten, the U.S. invaded Cuba to expel the Spanish and between 1898 and 1922 there were three separate extended periods of U.S. military occupations of Cuba with troops mustered in New Orleans at a time when ragtime music was evolving into jazz in the Crescent City. The story of Afro-Cuban jazz, however, actually begins in Haiti in 1791 when the Haitian slaves revolted against their slave masters. The French colony was then producing 40 percent of the world’s sugar output, but by 1804, with the revolution successful, the sugar industry was in shambles. Cuba and Louisiana (not then part of the U.S.) jumped in to fill the void and dramatically increased the number of slaves brought to each area, with Cuba becoming the largest producer of sugar in the world by 1840. As a footnote, during the period of slavery in the Americas, more than 1 million slaves were brought to the small island of Cuba, twice the number of slaves brought to the U.S. Both Spanish and U.S. slave masters lived in fear of revolt by their slaves and operated their plantations like prisons. However, they diverged in their approach by allowing slaves to make music. In the U.S., African drumming was prohibited for fear of the drummers communicating plans of an insurrection. An exception was in New Orleans’ “Congo Square,” where the slaves could play African drums on Sundays only. Cuban slaves on the other hand were allowed to play African drums and the clave, a pair of rounded hardwood sticks (dowels used in ship building) used to play polyrhythms that came from Africa. The primary rhythm is also known as clave, a five beat pattern (3-2 or 2-3) which is the foundation of Afro-Cuban jazz. This is the proverbial “fork in the road.” Cuban slaves, significantly greater in number than U.S. slaves, retained a strong connection to their African drumming and polyrhythmic roots and melded them with a Spanish music tradition. The result wasn’t the same “gumbo” as in New Orleans, where a much broader and diverse European music tradition was fused with the slaves’ emphasis, out of necessity due to the lack of access to drums, to a music shaped by simpler African rhythmic patterns and vocal traditions. Also consider that Cuba didn’t abolish slavery until 1886, 21 years after the US and therefore the rhythms of Africa continued to be renewed in the slave population of Cuba much later in time than in the U.S.
“Jelly Roll” Morton, a New Orleans ragtime and early jazz piano player, was clearly influenced by the music of Cuba and the habanera (literally Havana) rhythm, which was one of the African polyrhythm patterns brought to Cuba by the slaves. He famously referred to it when he said: “You got to have that Spanish tinge” in the music. Without question, the Afro-Cuban musical motifs were influences as jazz began to evolve in New Orleans, but the branches of the jazz tree grew in different directions. Fast forward to the early 1940s, Cuban bands are established in NYC playing popular Cuban dance music (mambo). Mario Bauzá, a Cuban trumpet player living in NYC since the 1930s, composes in 1943 the first true Afro-Cuban jazz tune, “Tangá” (African for marijuana), blending American jazz with clave. By the mid-40s, Afro-Cuban jazz is taking off and Dizzy Gillespie, the great bebop trumpeter, is searching for a new sound for his music. Dizzy is good friends with Bauzá, and in 1947 on Bauza’s recommendation, Dizzy hires Chano Pozo, a Cuban conguero (conga) virtuoso. Chano joins Dizzy’s world famous band as the first “Latin” percussionist and they jointly write the classics “Manteca” and “Tin Tine Deo,” fusing bebop and Afro-Cuban music. Unfortunately, their musical collaboration is short lived as Chano is killed at the age of 33 in a bar fight in 1948. It is impossible to single out any one musician that should be credited with the development of Afro-Cuban jazz, but Bauzá, Dizzy and Chano, notwithstanding his early death, were seminal figures in the music’s creation. An article about Afro-Cuban jazz would not be complete without a brief mention of the key percussion instrument used to make the distinctive sounds of Afro-Cuban jazz: congas, timbales, güiros (gourds played with a stick), bongos, and claves. Cuban musicians often joke that they get to play all of the above, but American jazz musicians only get to play the drum kit. With the lifting of the embargo of Cuba by the U.S., Vail Jazz is pleased to present in concert Maraca and his Latin Jazz All-Stars lead by Cuban flutist Orlando Maraca on Aug. 18 at 6 p.m. in Lionshead as part of the 22nd Annual Vail Jazz Festival. 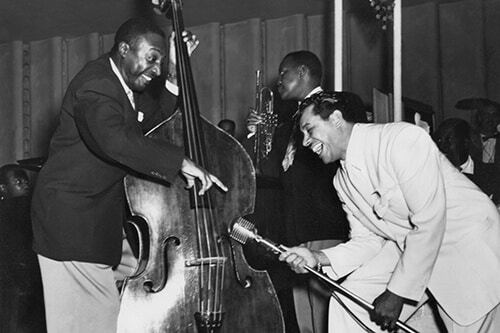 A famous bass player and prolific photographer, not to mention a man of many nicknames, Milt Hinton chronicled jazz through the ages from the 1920s up until his death in 2000. Revealing a colorful sample of the mark he made, a digital exhibit of Hinton’s work and music will be presented at the Lionshead Welcome Center four times daily, from Aug. 3 to Sept. 5. It will air on the big screen at10 a.m. 12 p.m. 3 p.m. and 6 p.m. But that’s just the teaser for Vail Jazz’s ongoing Hinton tribute this summer. In addition to the display at the Lionshead Welcome Center, the digital exhibit will be shown each night of the Vail Jazz Party (Sept. 2-4) in the lower lobby of Vail Mountain Marriott Resort, where the evening sessions take place. The riveting documentary, “Keeping Time: The life, music and photographs of Milt Hinton,” will be shown at the Marriott’s Grand Ballroom on Friday, Sept. 2 at 2 p.m. The documentary chronicles the storied 70-year career of Milt Hinton, embracing the rich life of a remarkable musician who recognized and recorded history as he was playing it. Tickets are $20 or included in the weekend passes. Vail Jazz’s grand finale spotlight on the famed bass player is John Clayton’s Multi-Media Tribute to Milt Hinton, which includes narration by Clayton, who is himself one of today’s leading jazz bassists. He will share anecdotes and stories, video clips and stills along with what are sure to be powerful live renditions of Milt’s favorites with a quartet on stage. This is one of four sets that make up the Friday Evening Session of the Vail Jazz Party. Tickets are $75 in advance. Keep an eye and ear out for Milt Hinton in Vail this summer. For more information and tickets to the documentary or John Clayton Tribute to Hinton, visitwww.vailjazz.org or by calling 888.VAIL.JAM. The Milt Hinton digital exhibit is made possible through a partnership with the Town of Vail’s Art in Public Places board and with the Milton J. Hinton Photographic Collection, directed by David G. Berger and Holly Maxson. Join us August 18th, as Vail greets flutist Orlando “Maraca” Valle and his Latin Jazz All-Stars to Vail Jazz @ Vail Square starting at 6 pm. Performing with a seven piece band, you can already hear the exotic Latin beat of the congas and percussion, the warm sounds of salsa on the piano, the bright melodies of the trombone, groovy, fusion inspired bass lines, and the hot jazz sax making their way to Vail. 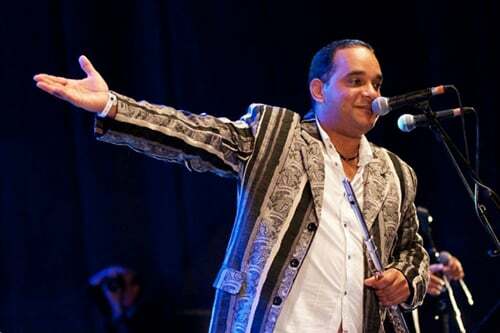 For over twenty years, Maraca and his Latin Jazz All-Stars have composed and arranged the authentic sounds and feelings from the Cuban culture. In 2003, Maraca received a Grammy nomination for Best Salsa Album with their album Tremenda Rumba, while also, topping the Billboard charts. Having performed Afro-Cuban music in over 41 countries, the road has not been easy for this Cuban band. 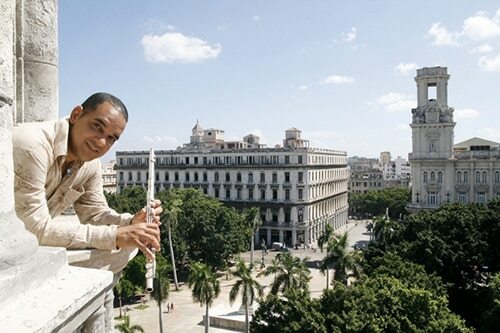 While politics have played a frustrating part in many Cuban musicians careers, as many Cuban bands have been restricted to travel and performing this rich music for fans abroad. However, Maraca continued to fight for Afro-Cuban music, and despite overwhelming visa and immigration laws, they encouraged listeners to not forget Cuban music and the Cuban people. In this time of turmoil, it was music that played a large part in bridging cultures together. It was musicians such as Maraca that started normalizing relations between countries, fighting for music to bring one another together. Maraca’s music makes the listener feel intrigued and sparks conversation. With important messages and themes expressed in emotional vocals, this band practices what they preach, and have lived through incredible life experiences. Always giving a first class show, this band works extremely hard on stage to put on a spectacular show. Pouring their blood, sweat and tears into every salsa song. Even today, Maraca plays with the traditional Cuban style and introduces contemporary harmonies and rhythms that sound energizing. Brining a little flair of Cuba to the audience, even here in Colorado! Music has truly shaped these musicians lives, and it’s evident as they perform with high enthusiasm night after night. 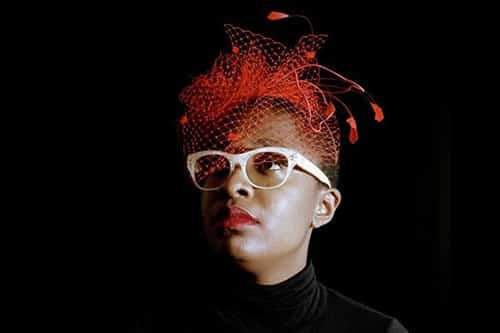 Cécile Mclorin Salvant makes her Vail debut Thursday, Aug. 11 at Vail Jazz @ Vail Square The performance is from 6 to 8 p.m. inside the all-weather jazz tent in Lionshead. General admission tickets are $20 in advance and premium seating is $40 in advance. For tickets or more information visit vailjazz.org or call 888-VAIL-JAM. A “child prodigy” is a young person endowed with extraordinary talent. When a well-respected music critic makes the pronouncement that a 6-year-old classical violinist is a child prodigy, he is opining that the young musician possesses the skills to produce a musical output comparable to what a very skilled adult violinist can produce. The critic is not saying that the prodigy is the best player the critic has ever heard (which would be a foolish statement about any musician, but it is regularly made), the critic is saying this kid is so good, he/she can enter the realm of adults who play classical music. It should not be forgotten that possessing prodigious talent doesn’t necessarily lead to fame and fortune. The pressure placed on a youngster branded as a prodigy is enormous. The world of music (and other disciplines) is littered with kid virtuosos, who for various reasons didn’t make it in their chosen fields, or for that matter, didn’t live productive and balanced lives. So, what if you are a true musical child prodigy, what does that lead to? It certainly puts you in the game at a very early age and many doors will be opened for you. Assuming you can successfully navigate puberty, stay focused, handle the media circus that swirls around you, deal with the expectations of family, friends, managers and agents, mature and develop as a person and definitively determine over time that you really enjoy making music, you then enter the challenging world of adulthood, where you are no longer a child, prodigy or otherwise. Hopefully the skills that you possessed when you were 6 have been honed and enhanced and you have “raised your game,” because the marketing edge of a being a wunderkind is gone. 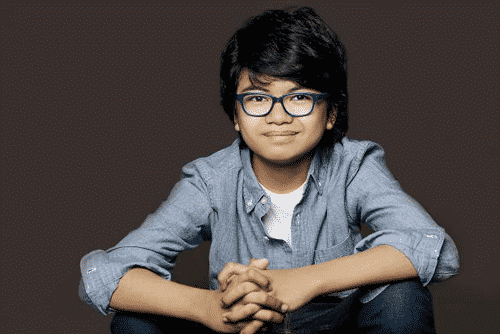 Josiah “Joey” Alexander is a 13-year-old jazz piano player from Indonesia. Proclaimed by many to be a child prodigy, his meteoric rise to international fame is a compelling story. Born in Bali, not exactly the hotbed of jazz, he learned about jazz by listening to his father’s records. By the time he was 6, Joey had taught himself how to play piano on an electronic keyboard that his parents had purchased for him because he was hyperactive and they hoped that the keyboard would allow him to focus his outsized energy. Learning by ear the music of the giants of jazz, he also taught himself how to improvise. He began playing in clubs in Bali while still 6 and shortly thereafter his family moved to the capital city of Jakarta, where he had greater opportunities to jam and begin formal jazz music studies. Home-schooled by his parents, his piano studies and the small world of jazz in Jakarta were the center of his universe. By the time he was 8, Herbie Hancock had heard him play and inspired him to continue. At 9, Joey competed against 43 musicians from 17 countries and won the Grand Prix at the 2013 Master-Jam Fest in the Ukraine. By 10, his fame had spread to the U.S. and in May 2014 he was invited to perform at Jazz at Lincoln Center in NYC. “Down Beat” critic Allen Morrison wrote after his performance: “If the word ‘genius’ still means anything, it applies to this prodigy.” Thereafter, he began touring throughout Asia, Europe and the U.S., performing at some of the most prestigious venues in the world of jazz, including the Newport Jazz Festival, where last summer he was the youngest performer in the history of the event. In 2015 when Joey was 11, he released, to great critical acclaim, his debut album, My Favorite Things. The album contains jazz standards that are some of the most complicated and nuanced music in the jazz canon, all of which he arranged. Also included was Joey’s own composition “Ma Blues,” establishing his standing as a composer. The album and his performances to follow have demonstrated that Joey is no longer a child prodigy, but that he is evolving into a great jazz musician without regard to age. For you see, to truly be a jazz musician is not about technical virtuosity, but it is the ability to bring to the music a creativity that is beyond, and frankly unrelated to, technique. It requires a creativity that is based upon a form of self-expression that is separate and apart from any endowed gift and requires the musician to have the ability to communicate with the listener. This musicality generally comes from a love and understanding of the music built over years of study and performance and a maturation generally shaped by the vicissitudes of life. Vail Jazz will present Joey Alexander in concert on Aug. 4 as part of the 22nd Annual Vail Jazz Festival.